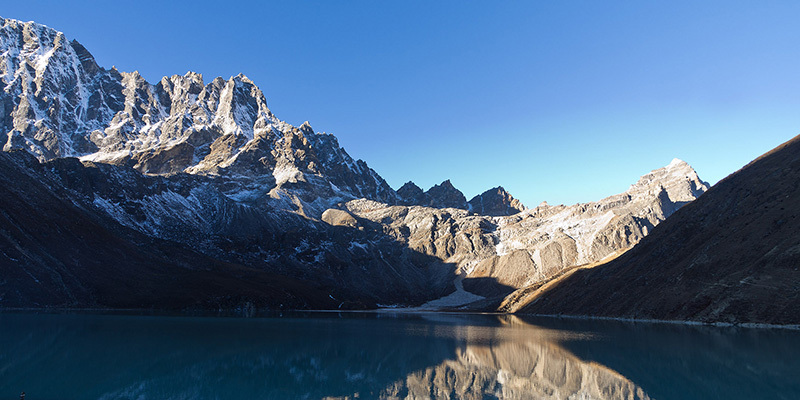 Gokyo Valley with Renjo La Pass Trek is the perfect trek for those who want to enjoy the beauty of the Everest region avoiding the busier trails. This trek takes you into the beautiful Gokyo valley, Gokyo lakes, Gokyo Ri, and the high mountain pass of Renjo La (5360m), and provides magnificent views of the Khumbu Himalayas including a close view of the world’s sixth highest mountain, Cho Oyu (8188m). Gokyo Valley with Renjo La Pass Trek starts with fly to one of the most dangerous airports in the world situated in Lukla. The flight to Lukla provides wonderful views of the landscapes and the high mountains. From Lukla, you begin the trek to Phakding and then to Namche Bazaar. You enter Sagarmatha National Park and follow the Dudh Koshi River as you make your way to Namche Bazaar, the main trading hub of Khumbu region . After resting in Namche, the journey takes you to Gokyo Valley. 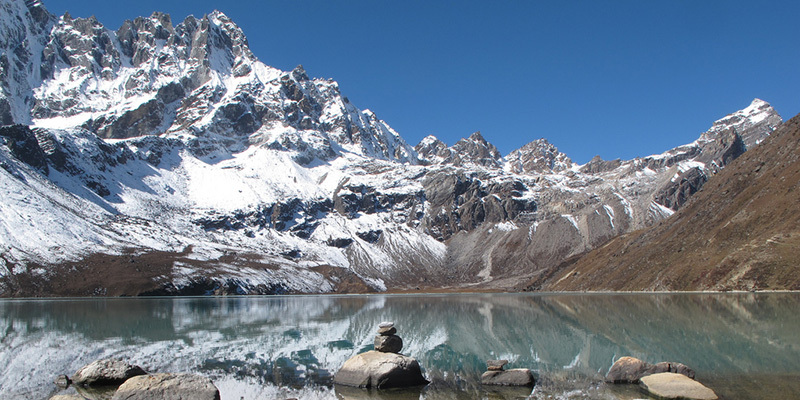 Gokyo Valley is famous for its delightful turquoise lakes which lie on the foot of the snow-capped mountains. Ngozumpa Glacier, the largest glacier of Nepal, and Gokyo Ri vantage point (5360m) are two of the major attractions of Gokyo Valley. From the top of Gokyo Ri, you can see Everest (8848m), Cho Oyu (8188m), Lhotse (8414m), and many other snow-capped peaks. Another main feature of this trek is the traverse through the frozen mountain pass of Renjo La (5360m), which provides the equally enchanting view of the Khumbu Himalayas. If you travel in monsoon season, you can witness the flowers pop out in Nagpala, giving you an illusion of walking on textured carpet. 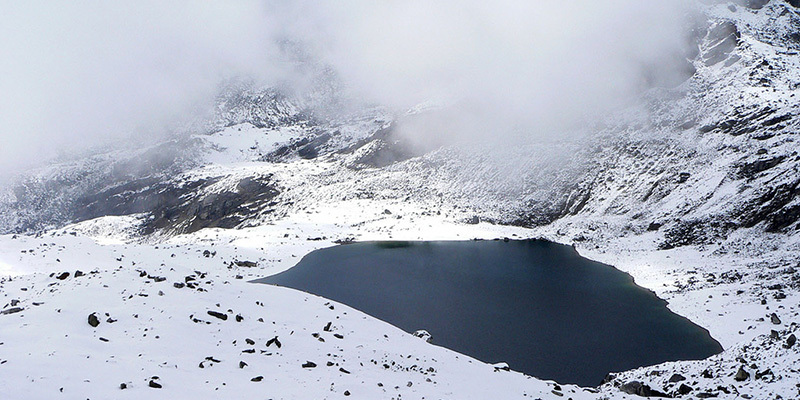 Gokyo Renjola Pass Trek is a beautiful Himalayan journey guaranteed to give you memories to last a lifetime. The trip begins with your arrival in Kathmandu. Our team representative will welcome you at Tribhuvan International Airport (TIA), and from there, you will be taken to the hotel for your overnight stay. After a fulfilling brunch at the hotel, the van will pick you up for the departure to Lukla. 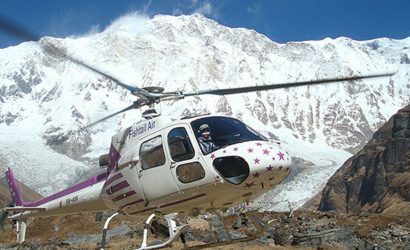 A fourty minute spectacular flight will take you to Lukla. After a brief rest, the trek begins. You start the trek with a descent to Dudh Koshi River and follow the wider trail to the village of Ghat, and then you will make an easy uphill walk to Phakding. Overnight in Phakding. The trail leads you to Namche Bazaar as you ascend alongside Dudh Koshi River. You can see the first glimpse of Everest (8848m) as you cross Hillary Bridge. Then you pass through the village of Jorsalle to reach Namche Bazaar. Namche Bazaar is a Sherpa town serving as the commercial hub of Khumbu region and is also known as the gateway to Everest. Overnight in Namche Bazaar. In order to avoid altitude sickness, it is very important to get adjusted to the climate of high altitude. You will spend the day in Namche Bazaar and explore its outskirts. 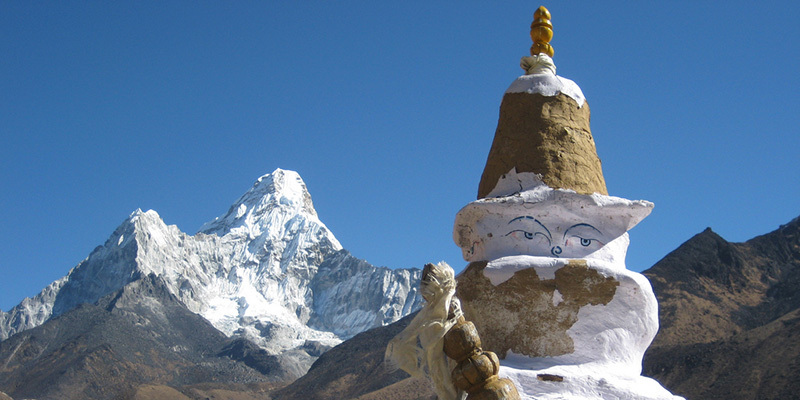 Check out the Sherpa Museum for an overview of the Sherpa culture and history of mountaineering. The nearby Thame village is also worth checking out. Hat Bazaar, the local marketplace, is open for trading on Saturdays. It is part of the larger Namche Bazaar, a shopping hub for all manners of trekking and mountaineering clothing and equipment. Overnight in Namche Bazaar. You ascend Mongla Hills and head downwards to Phortse Tanga. Then follow the path upwards through rhododendron and birch forests as the peak of Cho Oyu (8188m) starts to appear in the horizon. Reach Dhole after an easy climb through the forested trail. Overnight in Dhole. Today’s trek is short and pleasant. The day starts with a climb over Dhole via a scenic ridge. Crossing yak pastures and the tiny village of stone huts, you will reach Luza. Follow the trail along the valley high over the river to reach Machhermo by midday. You will have a stunning view of various snow-capped mountains throughout the day that gets even more beautiful from Machhermo. Overnight in Machhermo. 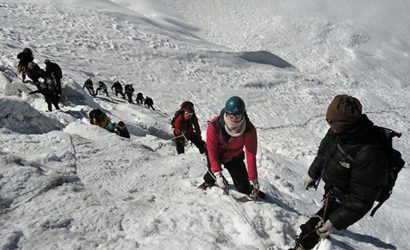 Ascend the hill and you can enjoy the views of Dudh Koshi Valley and Mt Cho Oyu (8188m). The valley widens beyond the ridge and the trail passes through a Chorten and reaches Phangga. Then you descend to the river and climb up to terminal moraine of Ngozumpa Glacier on a steep trail. Pass two Gokyo lakes before arriving at the third one, the holy lake named Dudh Pokhari, behind which the rugged Gokyo village is located. Overnight in Gokyo. Day 08: Day trip from Gokyo Village - Gokyo Ri (peak) 5360m. Climb Gokyo Ri (5360m), a hill that rises above the northern shore of Dudh Pokhari. From the top, you can admire the Khumbu Himalayas, the tranquil Gokyo lakes, and Nepal's largest glacier—Ngozumpa Glacier. Then you hike to the fourth Gokyo Lake. 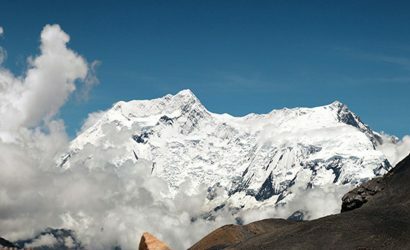 There is a spot called Scoundrel's Viewpoint from where you can get super excellent views of Everest (8848m), Cho Oyu (8188m), Lhotse (8414m), and other peaks. After the hike, you return back to Gokyo and take rest. Overnight in Gokyo. 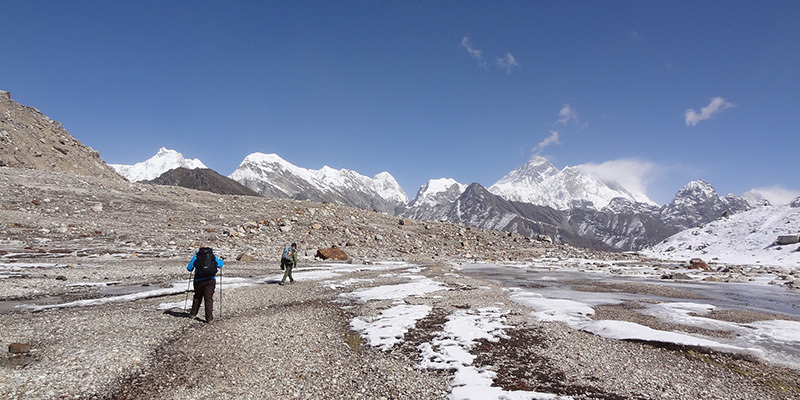 The trek kicks off at dawn and will pass through Renjo La Pass (5360m). Follow the Gokyo Valley downward, depart from the main trail, and turn towards the pass. You will reach the top of Renjo La after a careful climb through on a frozen trail amid glacier. 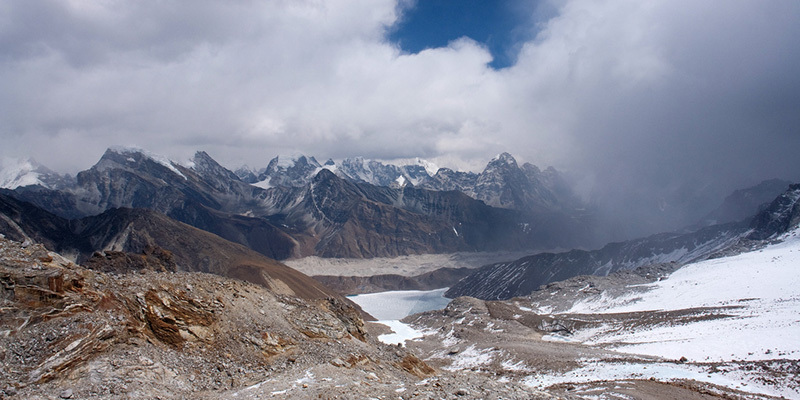 From the top, you will get an unforgettable view of the Khumbu Himalayas. Then descend carefully and follow the trail on the east bank of Bhote Khosi River to reach Lunde. Overnight in Lunde. Day 10: Lumde - Thame - Namche Namche Bazaar (3445m). 7-8 hours. 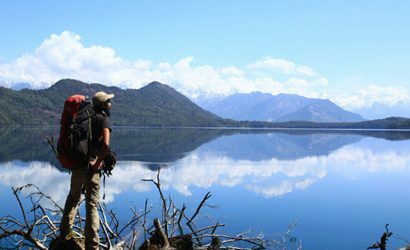 The trek route from Lumde to Thame follows a traditional route used by the Tibetan traders for centuries. Cross Bhote Khosi River and then descend to Taranga. The trail then winds through Bhote Koshi River ending in Thame village. Visit Thame Monastery, one of the largest monasteries in the Khumbu region. Pass through a check post today before arriving at the world’s uppermost hydropower station which provides electricity for most of the upper Khumbu region. 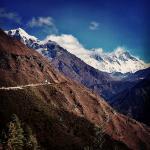 You will pass prayer flags, Mani walls, Gompas, Chortens, and beautiful Sherpa settlements en route to Namche Bazzar. Overnight in Namche Bazaar. Cross the Hillary Suspension Bridge and pass through several local villages. In about 2 and a half hours, you will arrive in Jorsalle. Then trek down further, crossing bridges to reach Phakding. Lunch will be in Phakding, and from there, trek up and down the hill for 2 hours to reach Lukla. Overnight in Lukla. Day 12: Fly from Lukla to Kathmandu. 40 minutes. After a good breakfast, take the flight from Lukla to Kathmandu. Enjoy the view of the Himalayas from above. Upon landing, you will be picked up by our company ca or van and taken to the hotel. Overnight at a hotel in Kathmandu. The thirteen day long trip comes to an end. After a heavy breakfast, our representative will have a brief session regarding the trip and collect your feedback. After this session, he will accompany you to the airport in our private transport 3 hours prior to the flight schedule. All your airport pick up & drop-off by private car / van. Two nights hotel accommodation in Kathmandu. Best available guest houses during the trek (mainly in twin sharing). Porter to carry your luggage (1 porter for 2 trekkers). All necessary trek permits, National Park permits and fees. Me and my husband did 11 days Gokyo Lakes with Base Camp Adventures.. absolutely beautiful trek and the best company ever!!!! Shree is the owner and since our first contact via email he was always very kind, helpful and promptly responded all my questions and doubts! He arranged the best accommodation and took care of us since the first day in Kathmandu. My husband had his luggage lost by Air Asia on the day we arrived and Shree was absolutely kind taking care about everything until we get the luggage back. We felt very welcomed, happy and safe. We had all the necessary information about the trek and the best guide Raj and porter Rebu who were absolutely fantastic at all times during the trek!!! They always made sure we were safe, comfortable,in good health conditions due to the mountain sickness and very flexible with the itinerary. They became our very good friends, such a beautiful and professional people!! 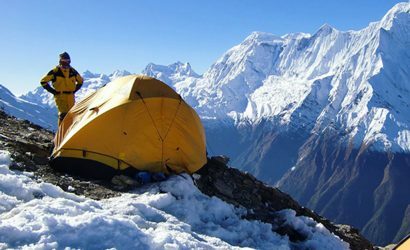 Himalayans Treks are UNFORGETTABLE with Base Camp Adventures! We HIGHLY RECOMMEND them!!! 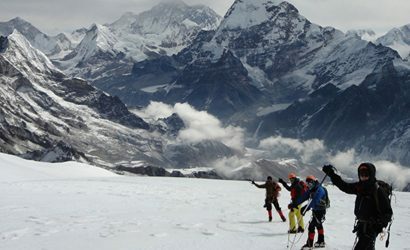 We are now looking forward to come back and do Everest base Camp!